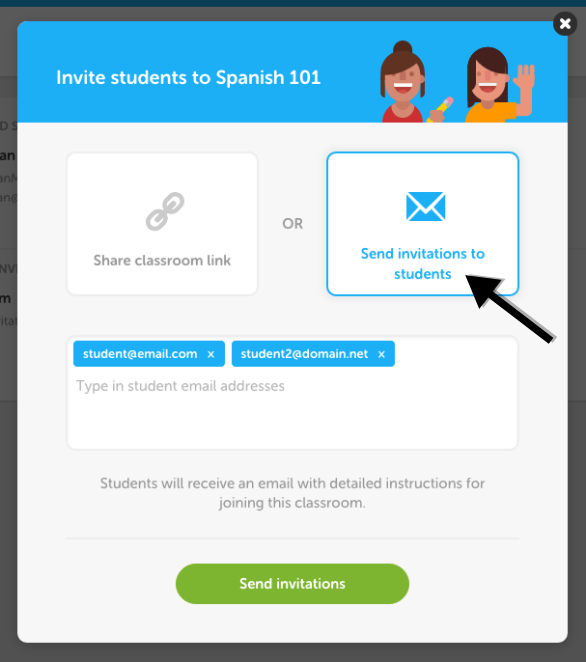 b) Send individual emails to each student directly from Duolingo by pasting a whole list of emails directly into the pop-up, or manually typing them in. And to make it all better, once you invite students, you will now be able to see how many (and which) students are yet to accept your invitation. Students who have not accepted you as an observer will show up in your classroom as a "pending invitation". As a bonus, in the coming days we will be rolling out a change that will send the teacher a warning via email when their student leaves their classroom. We at the Duolingo Team hope these new changes will improve your experience. Keep an eye on this forum to be the first to know about these exciting features as soon as they are released! Thanks for the update EvanMallory! 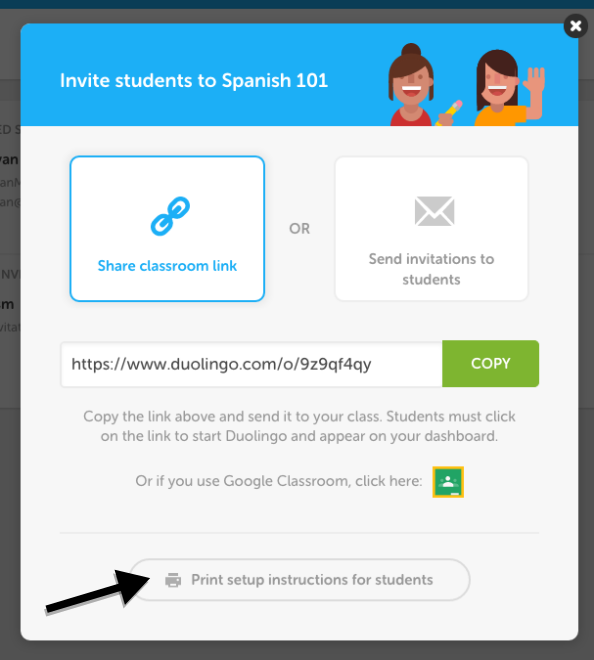 Question: if my students are already using duolingo (and have been for 12 weeks) can they join my new classroom without losing their progress? Yes! Joining your classroom will not affect their progress. Some of my students are having difficulty joining my classes. The "save" bar is not green (active) when my email and the class code is complete on their "join a class" page. What may we do to make this work? Sorry to hear you're having trouble. I'll ask some questions to try to reproduce the issue. Are the students trying to join your classroom from a mobile app or from the website? When you say "class code", do you mean the name of the classroom, e.g. "Spanish period 1", or something else? I'm talking about the class name. Thanks. Do you know what kind of device the students are using when they try to join your classroom? Karleen, can you tell us how the students are trying to join your class? I guess we are not clear on what the issue is. Are they trying from the link you sent them or from this page: https://www.duolingo.com/settings/observer ? Why do you have that duolingo for schools vision? I have one different. Hi, I made a Classroom for students and for people to join but it wont let me get back on? How do I bring up the page and how do I make a new one? Try going to schools.duolingo.com while logged in. Let us know if it doesn't work! Thank you it works :). Is there any way that we can block users from following our students? I have an unidentified user following my students and I and I wish we could block them. Yes. Have the students block that person by following these steps. I can do that on my computer, but I don't see the option to visit their profile on an IPAD, which is what my students have...I blocked them for me from my computer, but can't figure out how we would do it on the IPAD. The gear doesn't show up on an IPAD. Can we assign work easier to the new students? 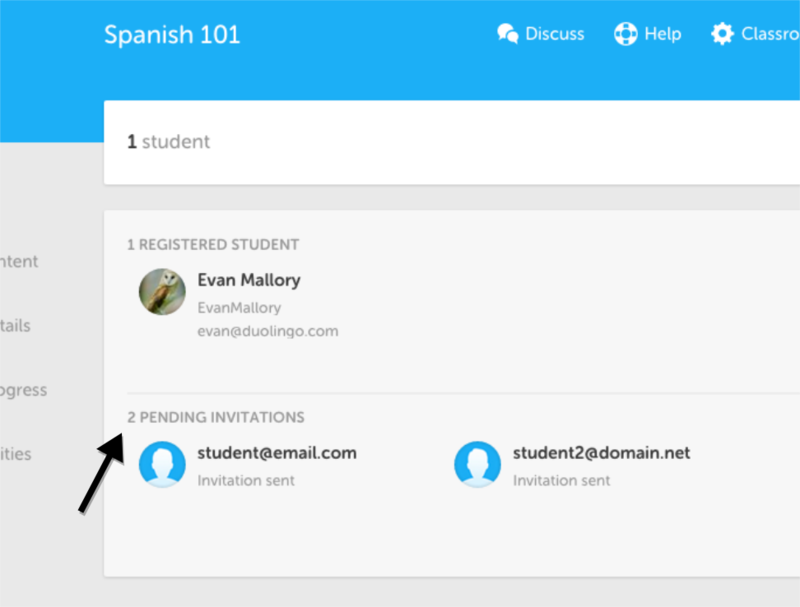 Please provide a shorter / easier URL for students to type to join a class!